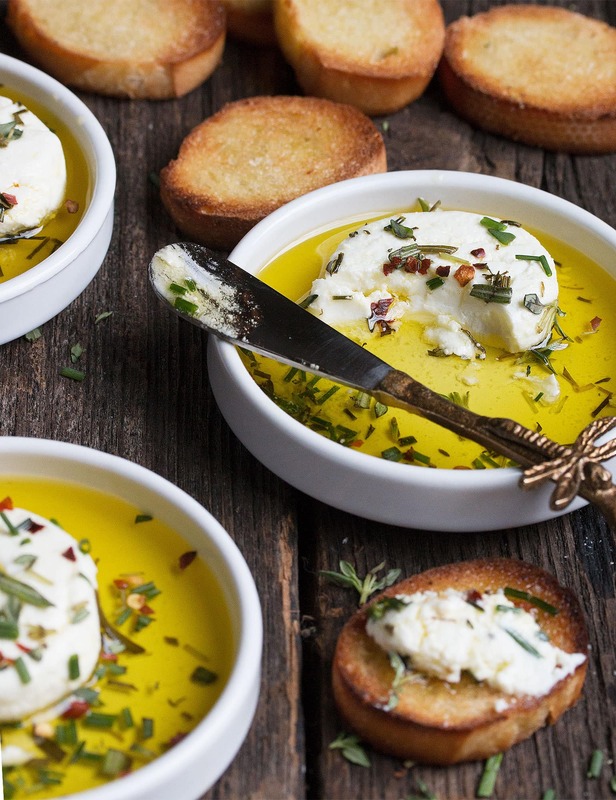 This Easy Marinated Goat Cheese with Crostini is a testament to the fact that sometimes the simplest of things are the best! 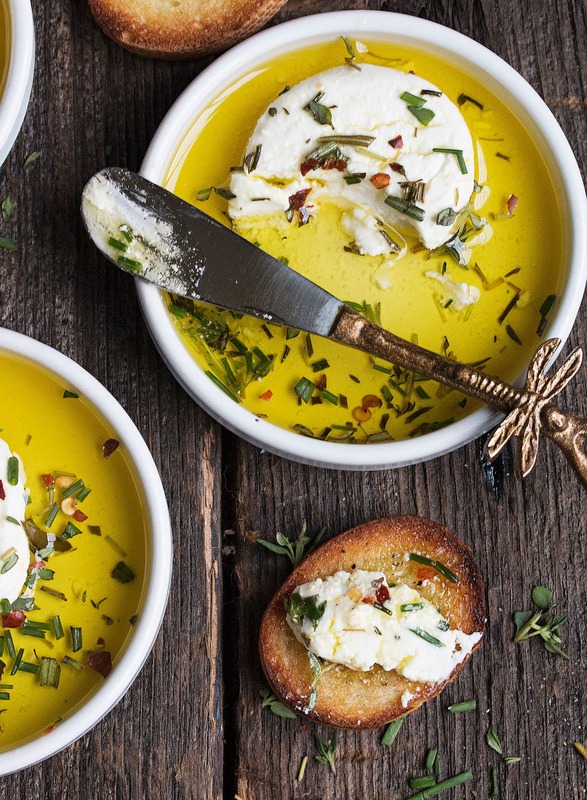 This Easy Marinated Goat Cheese with Crostini is one of my favourite holiday treats, not just because it’s easy and not just because it’s delicious goat cheese, but because it’s one of those simplicity meets perfection things. And I love when I discover that! 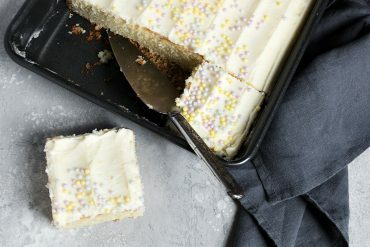 I first spotted this little beauty in Cooking Light and have been indulging regularly ever since. This time of year, I make up a batch regularly to keep in the fridge, so a little something lovely is always at hand. 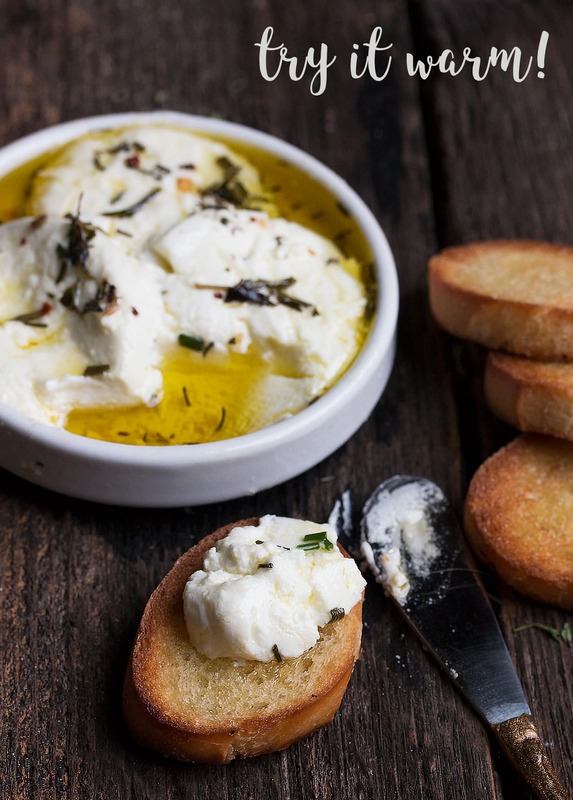 Enjoy this at room temperature, with crostini rounds (recipe below! ), crackers or just a lovely, fresh baguette slice (perfect to sop up that herb-infused olive oil). To change it up, place 3 rounds in a little dish, pop in a 325F oven for 15-20 minutes and enjoy it warm. 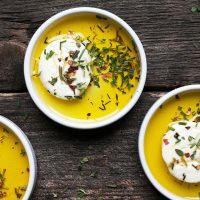 Beyond a delicious appetizer, you can use this marinated goat cheese on sandwiches and salads, too! When it comes to marinating, be sure to use a glass dish and find one that’s just large enough to hold the slices flat with a little space in between. If you use too large a dish, the marinade will be too thin. 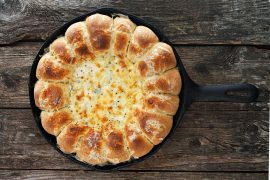 You may want to flip the cheese rounds over once or twice as it marinates. If you have some of the lovely infused oil left in the dish after the goat cheese is gone, add a few drops of balsamic to the dish and enjoy with some fresh bread. I like to keep my crostini a touch on the soft side, so I brush with olive oil and watch closely so they don’t over-cook. They’re just easier to eat and more pleasant than having a rock-hard crostini, I think. Do note though that the crostini brushed with olive oil don’t keep as well (they get a bit soggy/chewy as they sit), so if you are wanting to go the make-ahead route and want crostini that you can keep for longer, skip the olive oil and just toast them up. They will still be nice with the oil from the marinade. 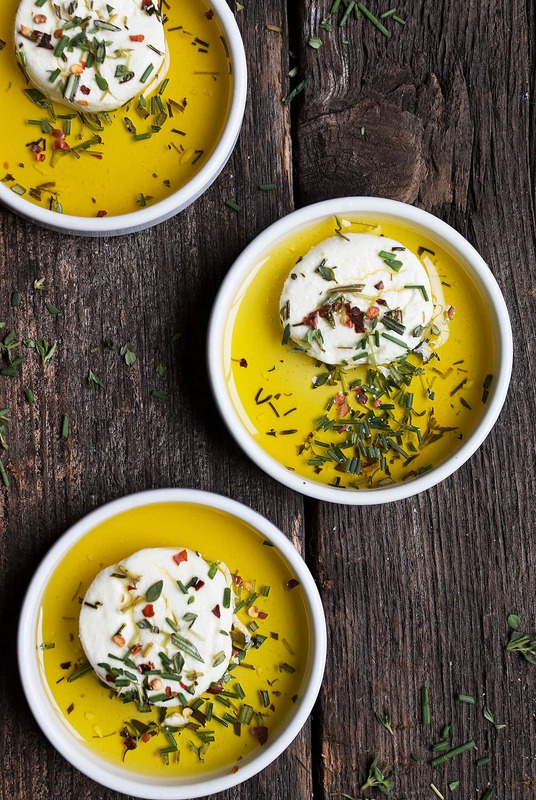 Try this marinated goat cheese warm! Simply place a few rounds into an oven-proof dish and warm in a 325F oven for 15-20 minutes. 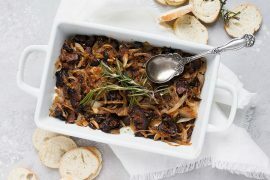 An easy and delicious appetizer, that can be served at room temperature or baked to make warm goat cheese. Left-overs are also great in sandwiches or on salads! NOTE! Prep Time does not include marinating time. Combine all the infused oil ingredients in a small saucepan on the stove-top over low heat. Allow to warm about 15 minutes to infuse the oil. 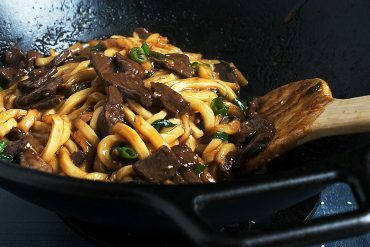 Turn off the heat under the pan and let the oil mixture cool to room temperature in pan. *Do be sure it is completely cooled before combining with the goat cheese, or the cheese will start to melt. Slice goat cheese log into twelve 1/2-inch rounds (or as many 1/2-inch rounds as you can cut from the size of goat cheese log you have). Gently press together and shape the rounds in your palm. Pour some of the cooled oil mixture into a glass dish baking dish just big enough to hold all the goat cheese slices in a single layer with a bit of space in between. Place cheese rounds on top of oil in dish in a single layer. 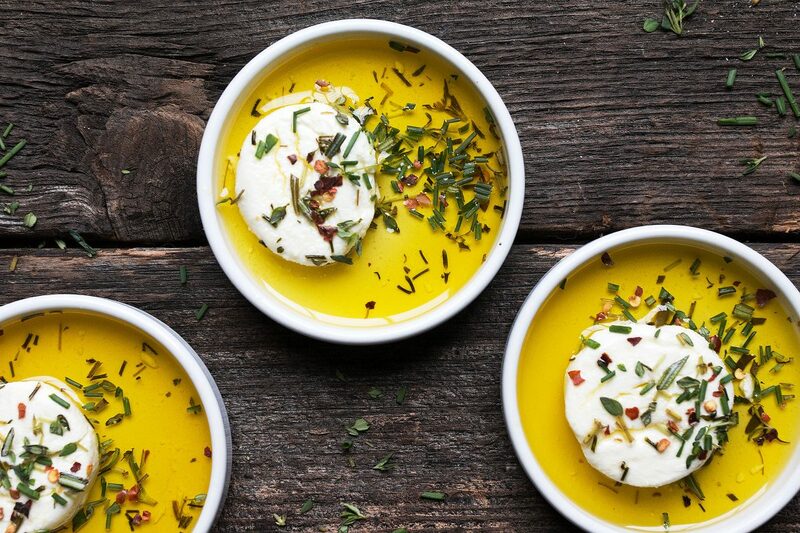 Pour remaining oil mixture over the cheese slices to cover, distributing the herbs on top of cheese rounds. Cover pan with plastic wrap and refrigerate at least 4-6 hours or overnight. For the crostini: Place baguette slices in an even layer on a baking sheet. Brush top with olive oil. Place under broiler about 6-inches from the heat until round are golden. Remove from oven. Flip baguette slices over. Brush with olive oil and return to the broiler to toast the other side until golden. Remove from oven and immediately sprinkle with a bit of salt and freshly ground pepper. Serve warm or at room temperature. *These are best used within a few hours of making. If you'd like to keep longer, skip the olive oil and just toast under the broiler. To serve, spoon a bit of the marinade into a small serving plate. Top with a round of goat cheese. Spoon a bit more of the marinade over-top. Garnish with additional fresh herb mix. Serve with crostini, baguette slices or crackers. Notes: Try this Warm! 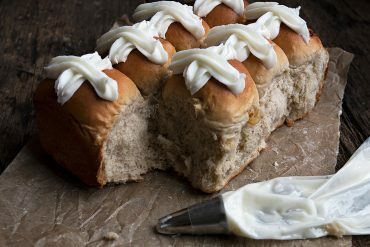 Place a few rounds into a small, oven-proof dish. Place dish on a baking sheet. Bake in 325F oven for 15-20 minutes, or until softened and starting to turn golden in spots. 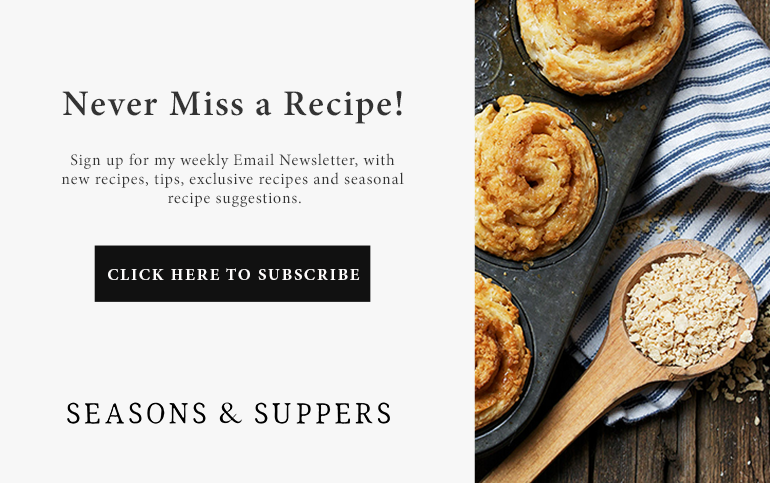 You can also find more of my favourite kitchen products on my Seasons and Suppers Amazon page! 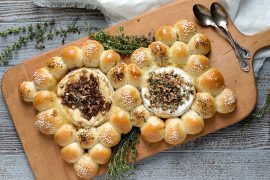 This looks so delicious, such a great appetizer idea! 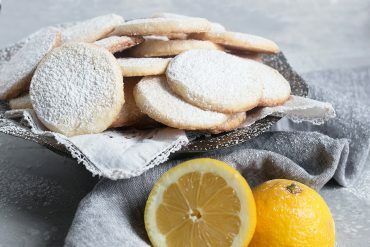 I’m making this for our Christmas Eve! It sounds and looks amazing! You are right about the simplest of recipes rendering the most perfect of culinary results. I enjoy marinated cheeses even if they do not look anything close to as beautiful as your goat cheese here. Of course you’d want to reserve some fresh herbs for the color:) These are such gorgeous pictures – I am going to have to marinate some goat cheese today:) Pinned! Love this Jennifer! You’re so right – the simplest things are best! Pinning this one! What an elegant appetizer Jennifer! It sounds like something I’d absolutely love! 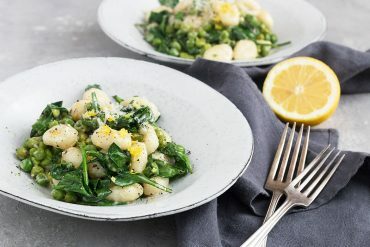 This is so up my alley, I could easily make a meal out of this tangy cheese ~ love it Jennifer!